Der junge Multimediakünstler Robert Marty verwendet in seiner Videoarbeit Vibration (2007) das Sendematerial vom ORF eines Skiabfahrtslaufs in einer sehr eigenen Art. Er legt die Abfahrtsläufe aller Skirennläufer übereinander, die immer gleichen Kameraeinstellungen zeigen bewegen sich die Körper der Skifahrer nahezu synchron den Berg hinunter, und lösen sich in ihrer Masse auf. Das Geräusch der Skier auf dem Schnee und die Kommentare Moderatoren, verschwimmen in der Überlagerung zu einem monotonen Rauschen. Der Audiopegel bestimmt die Abspielposition der Videosequenz. bestimmten Frequenzbereichen des Sounds zugeordnet. unterliegt. Er folgt widerstandslos dieser Diktion. und für den Zeitpunkt einer 1/25 Sekunde dargestellt. in dem das Flugzeug auf das Gebäude aufprallt. 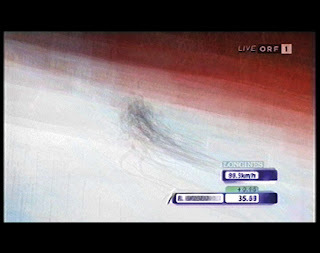 In his video work Vibration (2007) young multimedia artist Robert Mathy uses material from the Austrian television channel ORF – pictures of a ski-run – in a very peculiar way. He projects the descents of all skiers on top of each other and, as can be shown due to the identical camera positioning in each take, the bodies of the skiers move down the slope in a nearly synchronic way, dissolving in a mass. The background sounds of the skiing and the voice of the commentator become blurred to a monotonous noise as a result of their overlapping. 'Vibration' tries to analyse the vocabulary of sports tv. Multiple slalom rounds are overlaid and synchronised, thus inherent identical motions and their marginal differences become visible. Top sportive performances, spectaculary asserted by television, turn out to be statistic bagatelles in the homogenic images of information inserts and cut sequences. The audio gauge defines the playback position of the video sequence. Various video traces superpose eachother and are attributed to different frequency ranges. The disturbing Soundlandscape is achieved through different forms of expression of human existential orientation. Masculine and Feminine body sounds brief the picture of movement. The body is constricted in its movements, by depending on the mathematical laws of sound. It follows this diction unresistingly. Refusal of various frequencies leads to standstill, alternatively to paralysis. Shape is a reactive sound object. 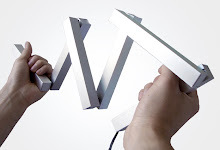 By changing its form, the recipient generates and modulates sound. 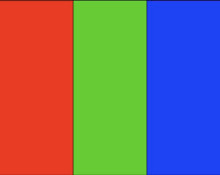 A video full-screen picture is broken down into its smallest parts and enables a view which, due to our perception, usually remains hidden in the subconscious. Each pixel of the original picture (consisting of RGB light spots) is blown up to full-screen size and displayed for a 1/25 second. In order to see a full picture, we now need 4 hours, 54 minutes, 54 seconds and 18 frames. The raw material for the video is a video still from a broadcasting shown all around the world on 9.11.2007 of the attac on the World Trade Center in the exact moment the plane hit the building.